Update: The numbers used in this post were preliminary numbers. I will update after we get the final numbers. 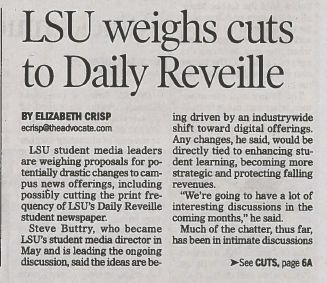 The Daily Reveille and other LSU Student Media products need a new strategy and stronger revenues to continue producing excellent products and providing valuable experience to our students. I blogged earlier today, in response to a story in the Advocate, about our process for developing a new strategy. 2015 total revenue for Reveille: $563K (a drop of 21 percent): Subtract the student fees, which were $219K both years, and the drop in advertising was 30 percent. Loss: $283K. I am pleased to announce that Molly Holmgren is joining LSU Student Media next Monday to lead our advertising and marketing teams. Molly brings a wealth of experience to Student Media, most recently as an integrated project manager and account executive at Zehnder Communications in Baton Rouge. She also has worked in advertising, marketing and community organizing for Otey White and Associates, Capital Area United Way, Louisiana Delta Service Corps and Concept Group. Molly will direct the student teams that sell advertising to support The Daily Reveille, Tiger TV, Legacy magazine, Gumbo yearbook, lsureveille.com and other digital products we might launch. The teams also sell transit ads on Tiger Trails buses and underwriting for KLSU-fm radio. Molly’s students design ads, market Student Media and plan events. She will be a key player as we develop new Student Media products and plan revenue strategies for them and guide the students in generating revenue to support those products. In interviews earlier this month, she made a quick and strong connection to the students she will be leading. As a courtesy to the candidate, I try to stick pretty close to the day’s schedule when we have someone in for an interview. So when the 11 a.m. time slot for my chat with Molly came up, I went to the colleague’s office where I thought she would be interviewing. No one there. I wandered down the hall and learned that the colleague had brought Molly down to meet some of the advertising and marketing students. I felt like I could trust her and that she could walk in here and immediately turn things around. 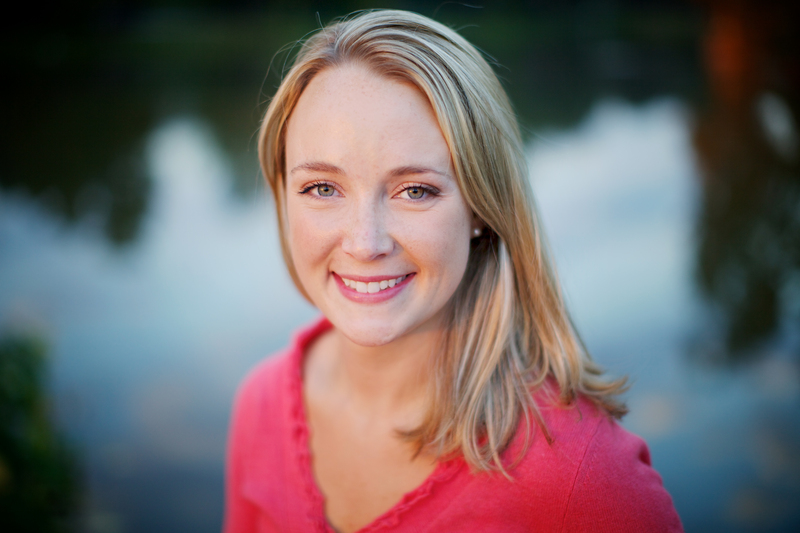 She’s been a project manager, account executive, and coordinated events for United Way. I feel like she has strong leadership experience. She has a lot of experience when it comes to servicing the account and customer service. She also has experience in negotiating. She is familiar with selling and marketing on different digital media including: social media, apps, mobile, and online. I really liked her! She’s easy to talk to, but also gets straight to the point and doesn’t mess around. All the questions we asked her she answered quickly and efficiently. That matched my own impressions and observations. And it described the person I wanted to hire. So I did. Molly’s a graduate of Winona State University who moved to Louisiana to join her husband, Per, who’s been working in sales in Baton Rouge for 10 years. They live near the LSU campus with their Bernese Mountain Dog, Bernie. She’s biked Hawaii’s big island, run more half marathons than she can remember and two marathons. That’s good (if a little intimidating). We’re planning to go the distance here in Student Media, so I’m glad to have leaders with stamina. I can’t wait to get started working with her. This post below originated as a document I shared with Manship School Dean Jerry Ceppos and the search committee in April when they were considering me for to be LSU’s next Director of Student Media. In a few weeks, Student Media will gear up for the fall after our slower summer pace. This feels like a good time to share my strategy with a wider audience (I’ll encourage the editors and station managers to share the link with their staffs). I welcome feedback on the strategy from LSU students, faculty and alumni, as well as from outsiders interested in student media. The director of LSU’s student media needs to lead a swift transformation to an operation that ensures a prosperous future for the student media operation and relevant experience for students. What we have now is a comfortable and familiar mix of traditional products. And that includes the website. Seniors graduating next month have lived their whole lives in the era of the World Wide Web. We should not pretend that we are on the cutting edge because we have a website and apps from an external provider. Our current mix of products simply is not sufficient for the future. Maintaining the status quo accepts a continuation and probably acceleration of the current declining revenue, provides an outdated experience for students working in student media and fails to meet the media needs of an increasingly mobile and scattered university community. Meeting the media needs of the immediate university community. Expanding our audience more effectively to the extended university community. Developing new and effective products to serve these audiences. Building strong revenue streams for the future based on these audiences and products. Providing LSU students with valuable experience in journalism, media management, digital sales and product development. A quick walk around campus shows that student media are not meeting the needs of the LSU community. I’ve done this several times, walking through the Student Union, library or some other place where students pass time, looking for a student using any form of LSU student media. They are rare. But the students are avidly using media, looking into phones, tablets and laptops, whether they are alone or gathered with friends. Outside each of the buildings, check the racks full of unclaimed copies of Reveille and Legacy. And this is not a generational issue. Faculty, staff and administrators are heavy users of digital platforms, too. I would lead efforts to use social media more effectively and produce a more dynamic website. I also would identify, plan and launch the digital products we need to serve the LSU community the way that students, faculty and staff actually live their lives (more on that in product development). Despite the unlimited potential reach of the website and apps, all LSU student media are produced essentially for a campus audience. But the LSU community includes sports fans, alumni, parents, lawmakers and others around the country and around the world with interest in what happens here. These people are not ignored, receiving alumni magazines and other PR material from LSU. But development of new digital products will give student media an opportunity to expand its audience and to become a valuable source of LSU news for these distant constituencies. We can meet some of the media needs of the LSU campus and extended communities through improvements to our existing digital products: the website, apps and social media accounts. But we need to explore whether we want to develop and introduce new digital projects, such as customized apps, email or text alerts, email newsletters, niche sites or commercial products designed to serve students as well as campus-area businesses or businesses interested in reaching the extended LSU community. Of course, without unlimited student time, part of the process of developing new products will involve shifting effort from existing products to the development and execution of new products. This will involve frank discussions among student media leaders and constituencies, with all options on the table, including elimination of existing products, reducing size and/or frequency of existing products and finding more efficient ways to produce products that should continue. The Director of Student Media should be a leader, but not a dictator, in this process. I plan to contribute ideas to the discussion, but I think my most important role will be to convene, stimulate and lead the discussion, rather than to make all the decisions. However good my ideas are, the full group involved in these discussions will come up with more and better ideas than any individual. And a heavy-handed approach in implementation can hurt the chances for success of even the best ideas. The support we can build for a new approach in these discussions will be more important than the details of the approach. So any examples I offer here are illustrations, not promises of what LSU Student Media will do under my leadership. What I will do is lead a planning process to transform LSU student media, and push that process to be adventurous and experimental. But that process will succeed best if we are carrying out a consensus, rather than following a single person’s agenda. Advertising revenues for student media are declining and will continue to fall unless we update how we serve businesses as well as the university community. When I was leading a workshop last year for student media publishers around the country, I asked them about the motivations of their advertisers, and they said, nearly unanimously, that the primary motivations were reaching the student and faculty audience and supporting the university and student media. That second motivation, philanthropic in nature, gives us an opportunity to bring existing business clients along as we make dramatic changes in student media. At the same time, expanding digital media products will help student media do a better job of serving the primary motivation of advertisers: reaching the university audience. Advertisers know how digitally oriented students and faculty are, so we can make a strong – and, I’m sure, successful – pitch that we can help them spend their advertising dollars better by sponsoring a mix of our digital and traditional products. Businesses with a philanthropic motive will be more patient during a transition time than advertisers supporting professional media. It will be critical for the Director of Student Media to join the advertising director and staff in explaining our transformation to key advertisers, winning their support for our plans and providing them better ways to reach the university audiences they want. If, for instance, we cut back on the frequency of Reveille print publication, we don’t merely accept a cutback in print advertising revenues. Instead, we go to our existing advertisers and tell them they can still buy print ads on our remaining day(s) of publication, but we pitch them on our digital options as well. Texas Christian University’s student media cut print publication from four times a week to once a week (following a recommendation I made as a consultant) and actually came out ahead financially. They were able to shift nearly all their print advertisers to the remaining print day and/or to digital ads, so they had no decline in advertising revenue. They also saved money in production and distribution, while printing the one weekly edition on improved paper stock (which advertisers liked). But we can’t be satisfied just with maintaining revenue. Pursuing an aggressive digital strategy gives us excellent growth opportunities in at least two ways. Expanding our audience gives us new advertising opportunities. For instance, if we produce an excellent email newsletter for Tiger sports fans, that’s a new sponsorship opportunity for advertisers interested in reaching that broader base, such as merchants selling Tiger gear or political candidates wanting to reach an audience that will be heavy with Louisiana voters. A product-development strategy doesn’t have to be limited to news products. For instance, we might develop a shopping/entertainment app/site featuring digital coupons from businesses in the campus area. Each new product we develop presents new revenue opportunities. The next director of student media needs to work closely with the business side of the operation to ensure that we make the most of sales opportunities relating to every change in our product portfolio, and turn our revenue decline into a dynamic period of growth. The job markets for all of our mass-comm majors increasingly demand digital skills and digital thinking. Pursuing a digital strategy will provide students with skills and experiences that will help launch successful careers. Our product development efforts might yield some products of interest to professional media, giving students valuable experience and contacts. Product development and digital journalism present journalists with new ethical challenges (and new situations for applying established ethical principles). We need to give students experience and guidance in making good ethical decisions in those challenges and situations, so they will be prepared to be ethical leaders in their professions. Involving students with product development will provide entrepreneurial experience that will increase their value in the job market and prepare some of them for success as entrepreneurs. Selling digital advertising opportunities will provide valuable experience for student media sales staff, who will enter a job market where digital advertising’s dominance is certain to grow. Building a reputation for digital excellence will help our students as they compete for jobs in a marketplace of businesses pursuing digital success. I welcome your suggestions as we pursue this new strategy, whether you are a member of the campus or extended LSU community, a veteran of student media at other universities or just someone interested in helping us succeed. Update: This post has been updated three times since originally posting, most recently on Sept. 3. Updates can be found in boldface. Last week I noted that the New York Times consistently fails to meet its own standards regarding unnamed sources and linking to digital sources of content. I followed up the next day with another post on linking. I wasn’t planning a follow-up on unnamed sources, unless anyone from the Times responded. I don’t have a lot more to say about unnamed sources today. But I must note that the Times made two embarrassing and significant corrections on its coverage of possible investigation of Hillary Clinton’s emails (or rumored or speculated investigation; we don’t know, because the Times’ sources have been so wrong on this and so poorly identified). Does that sound familiar? Where have I heard that before? From another Times staffer, actually. Remember who said, “If your sources are wrong, you are wrong”? That was Judith Miller. I won’t elaborate here on Judith Miller, but if you’ve forgotten about how she damaged the Times’ reputation, I have several links at the end of this story. As I’ve said repeatedly, journalists, not sources, are responsible for the accuracy of our stories. Another update: Newsweek’s Kurt Eichewald has a fascinating analysis of the Times’ errors and corrections. We don’t try to persuade sources to go on the record or find other sources who will speak for the record as a courtesy to the curious. We do it for credibility, accuracy and accountability. Sometimes people with valuable, accurate information have valid reasons (fear of losing their jobs or because they are breaking the law by telling us, for instance). Other times, reporters are being manipulated by liars with agendas. Or sort-of honest people who don’t really know the facts are telling reporters what they think they know, but demand confidentiality to avoid accountability. I don’t expect anyone from the Times to respond to me on this issue. But someone at the Times should reconsider whether that newsroom has grown too trusting of unreliable sources. The “senior government officials” cited didn’t deserve the Times’ trust. So why does the Times deserve ours? 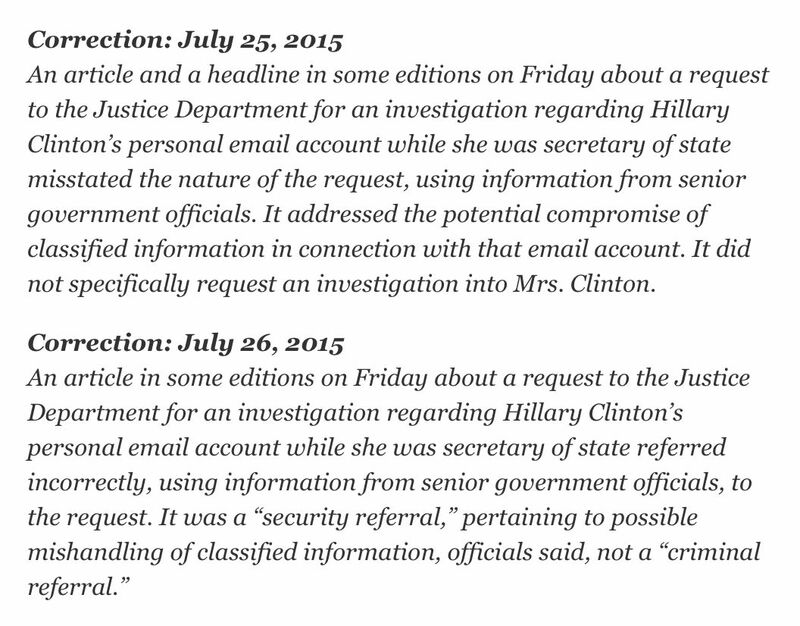 Corrections on the New York Times’ coverage of Hillary Clinton’s emails. I remain an optimist that newspapers aren’t dying. But if they die, the cause of death will be suicide, not that the evil Internet killed them. Hyperlinks are not a matter of life or death, even in the digital age. But failure to adapt can kill your business, or an entire industry, and hyperlinks are a key illustration of newspapers’ failure and unwillingness to adapt. Shan Wang of the Nieman Lab addressed the issue of linking in a post yesterday (I did too; we were both responding to a post on linking by Margaret Sullivan, New York Times Public Editor).